Pabst Mansion in Milwaukee was home to the famed beer baron Captain Frederick Pabst and his family, and built in 1890. The historic, award winning mansion is a sign of the continued success of the Pabst brand and cultural significance of the property. The Pabst Mansion was conceptualized by George Bowman Ferry and Alfred Charles Clas in 1890 as the family home for Captain Frederick Pabst, the famous Milwaukee beer baron. Construction of the home took two years and was finished during the summer of 1892 at the cost of more than a quarter of a million dollars including the home furnishings and art collections. The home was sold in 1908 and became property of the Roman Catholic Archdiocese of Milwaukee and home of the archbishop. This use continued for sixty years until 1975 when the mansion had plans underway for demolition. The mansion was spared and was put on the National Register of Historic Places after opening to the public as an award-winning museum in 1978. 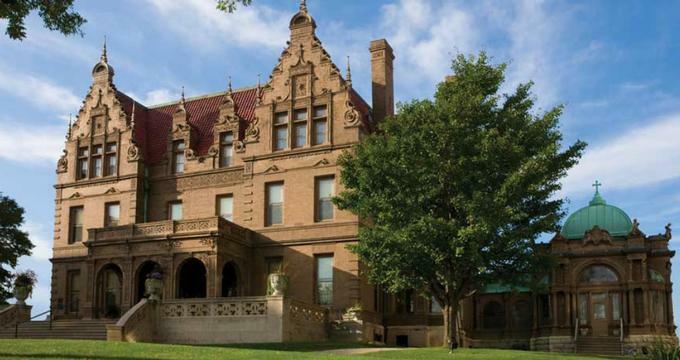 The Pabst Mansion is 20,019 square feet with 5 full levels including a basement, 3 livable floors, and an attic and 66 rooms in the total original construction. The modern-day value of the Pabst Mansion is $32.7 million. The Pabst Mansion in and of itself is a work of art and is in a constant state of restoration. The process to save the mansion began in 1978 but 20,000 square feet of rooms need restoration, preservation, and maintenance. The organization uses original photography from the home’s interior to replicate the room’s style and design to get it as close to the original as possible. Docent Lead Tours- Tours of the gallery are 75 minutes long and guided through all three floors of the museum. Guided tours are offered hourly on the hour. Reservations may be made for groups of 15 or more. Public Grand Tours are offered twice per month and cover all 5 floors of the mansion. These tours are up to 2.5 hours long and must be reserved two weeks in advance. The Grand Tour is only handicap accessible by elevator access to 4 out of 5 levels. Decorative Arts- One of the Pabst Museum founders, Florence Schroeder, donated custom furniture to the mansion, along with many other donors that have added to the collection of 19th century decorative pieces that fill three rooms of the home. Members of the Pabst family have also loaned pieces of their personal collections to the museum. Many artifacts from Captain and Mrs. Pabst personal collections have been donated to the museum over the years such as paintings, manuscripts, letters, their library, ceramics, glassware, clocks, and furniture. Fine Arts- Captain and Mrs. Pabst were known in the community for being art connoisseurs and had amassed a large collection of paintings that were on displays in their home, offices, and restaurants. By 1897, The Pabst family owned the finest private art collection in the region which would continue to grow. After the Deaths of Captain Pabst in 1904 and his wife in 1906, the art collection was divided up between heirs with half of the paintings currently having known whereabouts. Some paintings are in possession of the Pabst family, others are donated or sold to museums, while others are at the Pabst Brewing Company. The Archives- Founded in 1994, The Pabst Archives is the collection of all manuscript materials related to the Pabst family and business, other historic, local macrobrewers, and Milwaukee architecture and society of the Victorian Era. There are two annual special events that are used to raise funds for the Pabst Mansion. Brunch with The Barons- This event held in June at Forest Home Cemetery welcomes families to brunch with the “Beer Royalty” of Milwaukee as they walk through the cemetery’s “beer path” past legendary folks such as Blatz and Pabst among others. Tickets can be purchased online for this 4 hour event. Summer Wine Tasting- Also in June, the annual summer wine tasting is held at the Pabst Mansion and includes live entertainment on the terrace, a sampling of wine, and light appetizers. Tickets must be purchased in advance. Private Events- The Pabst Mansion is the perfect backdrop for private vents such as weddings, receptions, corporate events, rehearsal dinners, bridal showers, engagement parties, meetings, and other private events. The mansion is a 100% nonsmoking venue. Other regulations are provided online, included pricing, preferred caterers, and reservation information.